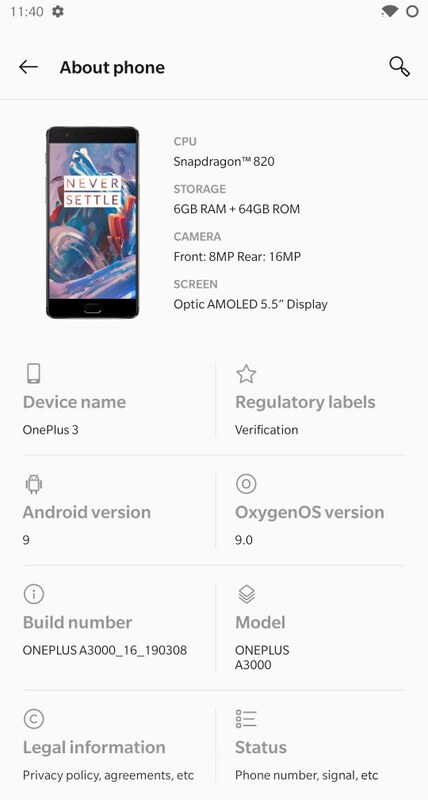 Oxygen OS 9.0 for OnePlus 3 and 3T based on Android 9 Pie leaked (Closed Beta) - OTA Downloads available! Leave a Comment on Oxygen OS 9.0 for OnePlus 3 and 3T based on Android 9 Pie leaked (Closed Beta) – OTA Downloads available! OnePlus 3 and 3T are still one of the most popular and powerful Android phones available in the market. After their launch, the phones took the world by storm. Following the footsteps of these devices, the manufacturer launched OnePlus 5 and OnePlus 6 which gained equal popularity. The last two generations have already received the latest Oxygen OS 9.0 Pie OTA update on stable channel. It is time for the OnePlus 3 and 3T to receive Android 9 Pie to make their customer base happier than ever. Thus, OnePlus promised official Android 9.0 Pie for the OnePlus 3 and 3T. Moreover, just recently, OnePlus started the closed beta program for OnePlus 3 and 3T to test the very early build of the popular Oxygen OS 9.0 firmware. It will feature the latest OnePlus apps like launcher, camera, gallery, file manager, switch, and also the brand new OnePlus gestures. This also includes all the Android 9 Pie features such as Adaptive Battery, Adaptive Brightness, Slice, Actions, Advanced AutoFill, DNS Over TLS, Digital Wellbeing, and support for Google Camera 6.1 mod natively. Now, if you missed the closed beta sign up window for the OnePlus 3, don’t worry. The Oxygen OS 9.0 closed beta builds have been leaked. The OTA update zips are now available for download as well. So if you would like to test out the closed beta builds right now, then you can. All you need to do is download the full stock firmware from below and flash it using Local Upgrade method or via TWRP recovery (recommended). Here are the full stock firmware (OTA update zips) of Oxygen OS 9.0 closed beta available for OnePlus 3 and 3T. Users of OnePlus 3 have captured this. Due to non disclosure clause, we cannot disclose the name of the uploader. Now, before you flash, note that this is a very early build. So it may come with some bugs and there is no way to report it to OnePlus. Moreover, you will have to wait for the beta 2 to leak as well. Or the wait can go long until the first Open Beta shows up. Also, in order to downgrade or revert back to Android 8.0 Oreo, you will have to factory reset your device and flash previous firmware using Fastboot method or TWRP recovery. There is no official way to downgrade or revert back until open beta becomes live. So flash at your own risk. Recommended to flash via TWRP for OnePlus 3 and TWRP for OnePlus 3T. Perform a Factory Reset before first boot. Your device may get encrypted during boot (data partition may be corrupted on encrypted devices). Magisk v18.1 is working on this build. Stock recovery will be installed and TWRP will be removed; unless you flash Magisk before first reboot. How to update OnePlus 3 and 3T to Oxygen OS 9.0? It is highly recommended that you use TWRP method to flash Oxygen OS 9.0 onto OnePlus 3/3T. This will make the procedure of reverting back to Android Oreo if you don’t like it. Before you flash, take a full Nandroid backup. Local Upgrade method: The Local Upgrade method is the easiest way to update any OnePlus device. Read detailed tutorial here: How to to flash H2OS full stock firmware over Oxygen OS or proceed below. Download the latest available OOS full stock firmware zip from above. Get the full firmware package from above for the OnePlus device and transfer the ROM file to the internal storage or phone storage. Place the zip file outside every folder.